“Are you coming up yet?” He leaned over the banisters, watching her. “Just a little while more.” Her fingers were covered in paint, her face screwed in concentration, putting the finishing touches on the rose. “It’s beautiful.” He sat down beside her as she laid her paint brush down, throwing an arm around her. And then she was crying in his arms, a raw, heaving sob. The sheets were tangled around them, her head lay on his chest. “Why?” he said sleepily, an arm slowly stroking her long, dark hair. “We might have to move,” he said. Sleep, Don't Weep by Damien Rice. Very cool - I like to weave songs between my prose as well. 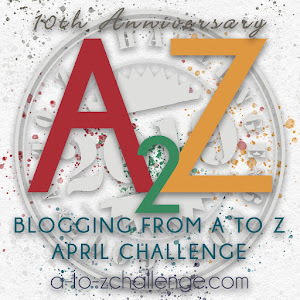 Enjoy your A to Z journey! I used to think I was the only strange person who did that! Lovely :) You're really great with dialogue!